There is a mismatch between what we can say and what we do say. A language corpus is an excellent tool to check what real speakers of the language actually say, what is typical, usual and frequent and what is rare and unusual. This is a great help to every teacher each time they have to face the infamous question Teacher, can I say this? A language corpus is also an inexhaustible source of examples – real examples in a natural context. Such examples can serve as language input, practice material or test items. Collocations is a buzzword not only in corpus linguistics but also in language teaching. Using correct collocations makes the language natural and advanced. 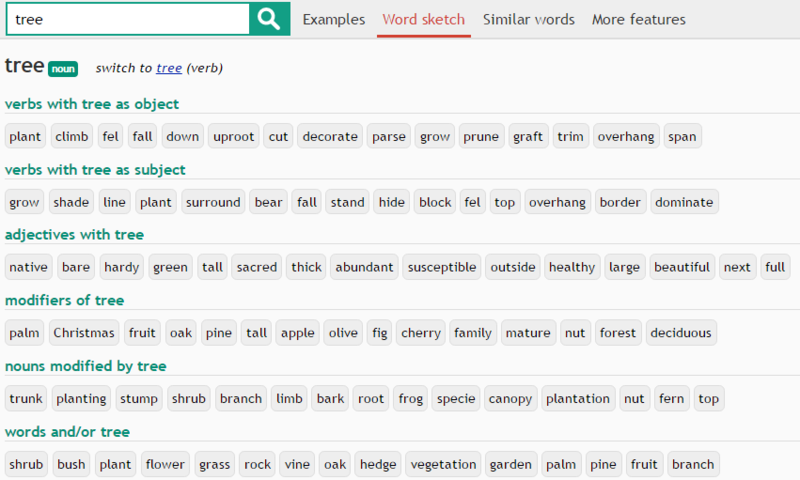 Sketch Engine has developed specific features to process large language corpora and extract collocations within seconds. To check if a word or phrase is used and how frequently it is used, use a concordance and observe how many instances it can find. Use a concordance but switch on the GDEX function in the view options. GDEX will find sentences which are illustrative and easier to understand for your students. The same feature can serve as a source of sentences for a polysemy exercise, i.e. an exercise when a student is given several sentences with a gap and is asked to come up with one word that fits all the gaps. The Word Sketch is a clear winner here. Just type a word and see lists of collocations divided into functional categories such as modifiers, objects, subjects etc. THOMAS, James Edward. Discovering English with Sketch Engine, 2015. Adam Kilgarriff, F. Charalabopoulou, M. Gavrilidou, J.B. Johannessen, S. Khalil, S.J. Kokkinakis, R. Lew, S. Sharoff, R. Vadlapudi and E. Volodina. Corpus-based vocabulary lists for language learners for nine languages. In Language Resources and Evaluation, volume 48, issue 1, March 2014, pp. 121–163. Adam Kilgarriff, Milos Husák, Katy McAdam, Michael Rundell, Pavel Rychlý 2008. GDEX: Automatically finding good dictionary examples in a corpus. In Proceedings of EURALEX, Barcelona, Spain. SKELL is a simple user-friendly interface to Sketch Engine for students and teachers of English. No need to worry about settings, just type a word and see how the word is used.